Crysis may be a few years old, but it's still one of the most graphically powerful games you can play. Normally that power is used to render huge islands, armies of panicky Korean soldiers and invading alien forces, but what if you took all of that power, and used it to create the biggest explosions you possibly could? Five brave gamers have done just that. Below you'll find videos of some of the biggest bangs in gaming. One man drops a fleet of helicopters out of the sky, another belly-flops onto a huge tower of exploding fuel trucks, and another man spawns a pile of 3,000 barrels and causes an explosion so ridiculous that he can't look directly into it for more than two seconds without it crashing his PC. You'll find videos of the five most insane Crysis explosions embedded below. There's only one thing better than a huge bundle of great games, and that's a free bundle of great games. You know what's even better than that? Five free bundles of great games. By stunning coincidence that's exactly the number of EA Store game bundles we have to give away today. There's more than £1700 worth of games up for grabs, so read on for a chance to get your hands on Battlefield: Bad Company 2, the Dragon Age 2 Digital Deluxe Edition, both Mass Effect games, Crysis, Need for Speed: Hot Pursuit and more. Five lucky winners will scoop a copy of each of the following games, courtesy of the EA Store. The huge, destructible battlefields of Battlefield: Bad Company 2 play host to some of the most frantic and explosive multiplayer scraps on the PC. As well as a wide range of tanks, helicopters and attack drones, there are tons of unlockable weapons for each of the game's four classes, so you can customise your load out every time you go to war. You'll also get a copy of the recently released Vietnam expansion which adds four new maps and a collection of new weapons and vehicles to fight with. Dead Space is a third person survival horror set on board a spaceship infested with aliens. The key to taking these creepy beasties out lies with Dead Space's arsenal of surgical weapons that let you clip the limbs off your foes one by one until all that's left is a wobbling torso. Disgusting? Yes. Satisfying? Even more so. Whether you start out begging for scraps in the Elven slums or fighting rebellion in your castle as a human noble, in Dragon Age: Origins you're ultimately destined to become a hero of Ferelden, one of the Grey Wardens responsible for putting down the menace of the Darkspawn uprising. You'll also get Dragon Age: Awakenings, an expansion set after the events of the main adventure of the first game, and a copy of the Dragon Age: Origins Ultimate Edition which comes with all of the game's nine content packs, adding extra armour and quests to the game. If you've ever wanted to command your own spaceship and save the universe, Mass Effect will let you do exactly that. There are few better lead characters than the charismatic and occasionally violent Commander Shephard. Spend your career through the universe punching out reporters and shooting suspects, or play it cool and become the saintly saviour of the cosmos. Commander Shephard returns to once more take on the galaxy's greatest foes. Mass Effect 2 builds on almost every aspect of the first game, adding even more characters, more spectacular locations and a brace of satisfying new combat abilities. It's been out for more than three years now, but Crysis is still one of the best looking games you can buy. The sandy beaches of the game's massive island are a beautiful setting for the game's superhuman firefights. Your character's nanosuit lets you tear up your enemies with invisibility, super strength and super speed. Crysis: Warhead explores the emotional range of Psycho, one of the background characters from the first game. He even sheds a tear at one point. Then he pulls himself together, leaps onto a gatling gun and mows down an alien invasion singlehandedly. The best soap opera sim in the world, The Sims 3 lets you create your own family and control every aspect of their lives. Help them find a better job, true love and happiness, or just trap them all in a windowless room and watch the fireworks. You'll also get three expansion packs. The Sims 3: World Adventures lets you take your sim adventuring abroad and hunt for treasure among famous monuments. Ambitions lets you control your sim on the job, letting them become a firefighter, private investigator, doctor and even a ghost hunter. The Sims 3: Late Night takes the game to the nightclubs, letting you take charge of your sim's big nights out. Take command of your favourite football team and lead them to victory in FIFA Manager 11. You'll have to manage every aspect of your team, from their finances to player signings, to your tactics on the pitch if you want to have a chance of taking home football's finest silverware. If you'd rather be scoring goals than managing your strikers, you won't find a footballing sim better than Fifa 11. The revamped engine means even more realistic ball control than ever before, and a sublime animation system adds extra crunch to every tackle. In Need for Speed: Hot Pursuit it doesn't matter if you're a crook or a cop, you'll always be behind the wheel of a steaming supercar. As a cop you'll be enforcing the law at 200 miles per hour, ramming boy racers off the highways of Seacrest County. As a criminal your job is to beat your fellow racers while evading capture, earning rep and buying new cars as you go. If you fancy entering, there are a few terms and conditions. The offer is valid in the UK on www.eastore.co.uk, and is valid for PC Download only, and that no pre-orders, points packs or time cards are included and that offer can not be redeemed in conjunction with any other offer. The best thing about the space-borne survival horror, Dead Space is the array of ridiculous weapons you can use to cut up your alien enemies. To win, post in the comments below with a weapon capable of dicing the toughest monster. Tell us what it is, what it does, and give it a name. You must live in the UK to enter. The five entries that make us laugh the most will take home a bundle. Come back tomorrow for another great giveaway. The gift giving will continue all the way up to Christmas day. I will get in touch with the instructions on how to claim your lovely prizes. Huzzah! WhiteSilentTiger has a simple goal: create a good-lookin' little video game forest. I'd say it's mission accomplished! What's most impressive about this scene isn't that it was made by a modder, it's that it was made using the "old" CryEngine 2, which powered Crysis all the way back in 2007, and not the more recent version that will be running the upcoming Crysis 2. The fact so many games now appear on PS3, Xbox 360 and PC is a blessing for PC gamers who used to miss out on a lot of console games, but according to Crysis developers Crytek, it's a mixed blessing. "As long as the current console generation exists and as long as we keep pushing the PC as well, the more difficult it will be to really get the benefit of both", Crytek boss Cervat Yerli tells Edge magazine. "[The] PC is easily a generation ahead right now. With 360 and PS3, we believe the quality of the games beyond Crysis 2 and other CryEngine developments will be pretty much limited to what their creative expressions is, what the content is. You won't be able to squeeze more juice from these rocks." Interesting comments coming from a man who now has an interest in PS3 and 360 game development, what with Crysis 2 appearing on all three platforms (whereas the original game was a PC-only affair). He's going to hurt someone's feelings with talk like that! Really, though, is it that hard to scale a game's engine to such an extent that a PC version looks the generation ahead he claims it is? Half-Life 2 looked amazing on PC back in 2004, but still somehow found its way onto the original Xbox. Crytek have announced their next game. It's a free-to-play multiplayer military shooter called Warface focused on the South Korean market. Read on for more details, and the first two screens of the game. The game is being developed in Seoul, and will be aimed at the Asian market. It's a PC exclusive free-to-play military shooter powered by Cry Engine 3. The game will include a regularly updated player versus environment universe, interspersed with class based multiplayer fights and co-op missions. Beyond that, all we know at the moment is that it's set in the near future, and they called it Warface. Here are the screens. For PC Gaming Week, Kotaku has invited top creators to predict the future of computer gaming. Today, Cevat Yerli, CEO of Crytek, makers of legendary PC-only first-person shooter Crysis and 2011's PC and console Crysis 2. PC Gaming in the Future. When I started developing games for the PC nearly 20 years ago, both the Commodore 64 and the Schneider CPC 6128 were incredibly popular. Since then, the PC platform and its market have totally changed and I saw several trends coming and going. Within the next five years, the PC market is in my opinion growing and declining at the same time. While the market for Online PC Games (I mean Free-2-Play Games, Social Games and Casual Games) is continuously growing, the retail PC Games market is declining. Over the past two years it became apparent that more and more people play all kinds of online games and lots of the former retail PC Gamers switched to console games. By changing their consumption attitudes, the consumers "force" developers to rethink their strategies, thus, to some degree. For me, the business model of the future is "free-2-play" since consumers in the future won't be willing any longer to spend $50 or more for a AAA PC Game. So developers will start offering more and more free to play online PC games that at the same time allow for premium content. All leading PC game developers will serve the free-to-play market and turn their backs on the retail market. The current online games are characterized by low development costs (only about one tenth of the costs for a AAA title) and comparatively low quality. But, at the same time, they have fun gameplay. In contrast to the traditional retail PC Games, the pressure for initial quality is much lower with an online PC game. This means, that developers release an online game with a certain quality and then improve it over the time, bit by bit, together with the community. This is incredibly customer-friendly and so it is what the whole market become. The user is king. Over the next years a significant number of online PC Games will enter the market and due to that big amount of games, the quality pressure is going to rise in these markets, as it is now in the PC retail Market. The current price competition between retail and F2P Market will evolve into a content/ quality competition within the F2P Market only – similar to today's retail market. Consequently both, the costs and the quality will reach a AAA level. Since gamers thus basically get AAA games for free, the complete traditional retail PC Game market breaks down. After a while gamers will then see a major progress in gaming quality overall again in the PC Gaming Market. But how do developers then earn money? The community is key to the success, specifically the amount of free-to-play users that a developer is able to transform into buyers. An average 5-10% of all online PC game users buy premium content in the form of special items, boosters, etc. via micro transactions. "Non-monetized" consumers, on the other hand, will be turned into revenue contributors through community-driven advertisement that is experienced through social media networks supporting these games. To sum it all up: I am convinced that in the medium term, all leading PC game developers will serve the free-to-play market and turn their backs on the retail market. Cevat Yerli is president and CEO of Germany-based game development studio Crytek. His first games and development experiences go back to the 1980s with the Commodore 64 and the Schneider CPC 6128, where he worked on simulation games. His passion has always been creating and playing games. While studying economics, he began working towards his dream of founding a game development company. The dream became reality in 1999 when he founded Crytek with his two brothers. Cevat gives creative direction for all Crytek products. Normally, cosplay photos tend to focus on Japanese titles, or the really big games. Crysis is neither of those, so it's nice to see the PC gaming crowd represented in the adult dress-ups scene. 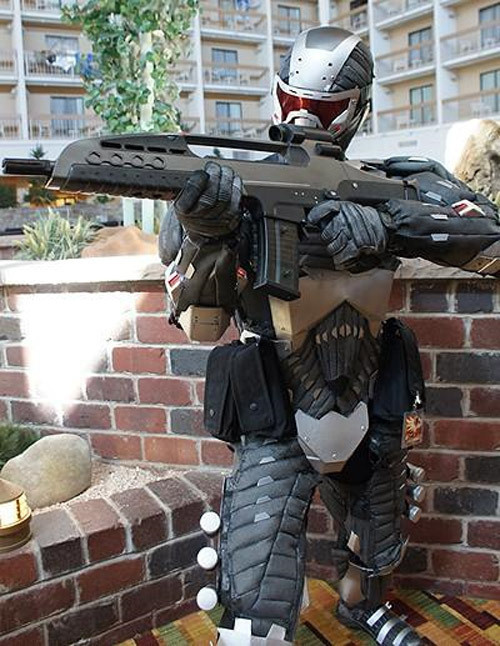 This is Anthony Le, doing a fine job of impersonating the star of the first Crysis, Nomad. He built the suit in around a month, which is impressive. We'd imagine it only took a few minutes, however, for everyone looking down on him from those apartments to consider calling the cops. In many genres, the gun is the point where the gamer meets the game, making it the single most important element in a given title. 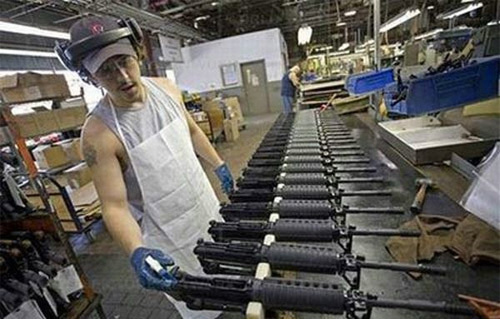 That makes the guys who make the guns important, too. So many titles, especially (and obviously) shooters, give you such limited interaction with the game world that what you do with your gun is often the extent of what you can do with the game. You shoot at people. You shoot at things. Most of the things you pick up are things for your gun, which you got off people you shot with your gun. In most shooters you're even spending the entirety of your time in the game looking at its world not through a pair of eyes, but down the barrel of a gun. 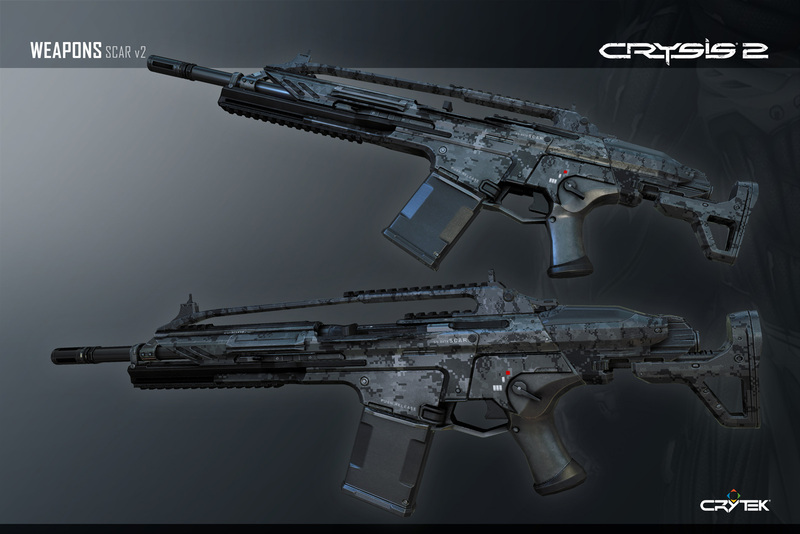 Being such an important part of so many of today's (and yesterday's, and tomorrow's) games, we thought we'd have a talk with a man who builds video game guns for a living: artist Gregor Kopka, from Crysis developers Crytek. "When you're living and working in Germany it's nearly impossible to get your hands on weapons", he tells us, explaining the process that goes into building a gun inside a video game. "Since my childhood I've been kind of addicted to the design of weapons, but I don't know much of the technical side of things". To get around this, Kopka is assisted by several Crytek staffers who do know the mechanical side of weapon operation, guys who "know almost every detail of almost all modern firearms". The team also spend a lot of time in various countries visiting shooting ranges, so that for reference's sake they can have first-hand experience of what it's like to discharge a variety of weapons. 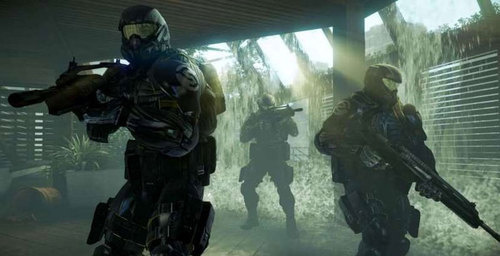 During early development of Crysis 2, for example, the team took a trip to the California desert for a recording session and let loose on almost every kind of gun imaginable, from handguns to submachine guns to assault rifles sniper rifles to a minigun. Those sounds then formed the basis for Crysis 2's projectile weapons. "Once that is done we always start with some quick sketches. After this I prefer to work with animators and designers with simple whitebox models (basic, unpainted 3D models), to find out the best position for the gun's animation and silhouette. I think it's important to start with a whitebox as you can quickly proof and test if your idea works when using a first-person camera position. I can see immediately what problems there may be." The next step Kopka takes is to work with concept artists on painting the weapon, and if that all looks good, then it's on to the toughest part of the job: coming up with something he's happy with. "The first person camera position can be tricky depending on the field of view and size. I sometimes wish to go back to alien characters or any other assets which are not viewed through the fixed camera position, but on the other hand I remember I have my own screen space and that's enough to forget all problems which comes with these kind of tasks." The final stage of Kopka's design work comes with turning these whitebox models – which are essentially 3D sketches – into both high and low-polygon models for use in a game, and then compiling and applying textures to paint over those models. That's all well and good for a simple weapon. One that's an actual real-world gun, or at least closely linked to the design and technology of today. But Kopka is working on Crysis 2, a game set in 2020 and featuring alien technology, so what happens then? Is there a line, I wonder, between making a gun look and sound "real" and making one that's fun for use in a video game? "I prefer a mix of both", he says. "It's great to have the freedom to go nuts but at the same time to use details of real guns to achieve the feeling of a weapon could really exist 10-20 years from now." "If you plan for example to create some realistic sci-fi weapons, which feel believable, you have to give the player an art design that he can understand and which is based on existing weapons." "People see guns in movies all the time and they know what a gun looks like. When you're going completely crazy as a weapon designer and add only details that haven't got anything in common with real weapons, you will quickly realize that it doesn't feel real." "Of course I could take some photos of real weapons and paste them together but then it wouldn't be a challenge and would not have its own style. You also have to use the right materials. Modern weapons have a lot of hard plastic which I personally like. It gives a beautiful contrast on the asset." Moving on from Crysis, I wonder as someone who spends their working life putting guns into video games, what are his favourite weapons? In real-life, it's an easy, quick response: the "good old M14 rifle", mainstay of the US armed forces between 1959 and 1970. For his own work, he's proudest of one of Crysis 2's weapons, the newly-redesigned Scar assault rifle, which you can see above. And the in-game work of others? "I've seen some really good ones in Bad Company. 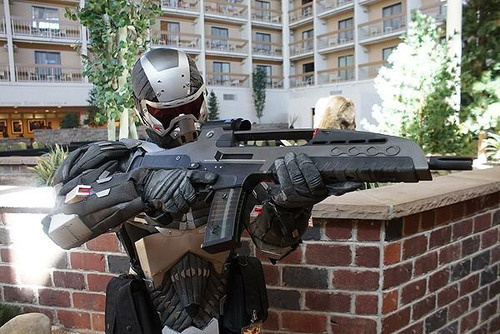 These guys did a great job on how the guns feel, and the sound especially supports this very strongly." Before we finish up, I ask one last question: guns may be a focal point in games, and games may be fantasy, but they're still guns, something that in real life are designed to kill people, and which in many countries outside the US are seen as dangerous and undesirable weapons. So does he think there's anything particularly wrong with video games for making guns such an integral part of so many experiences? "There is nothing wrong with adults that are playing first person shooters, or let's say watching action movies. I believe people who play games can tell the difference between virtual and real guns." Crysis 2 is no longer due in the vague window of Jan-Mar 2011, publishers EA having narrowed that down to two days in March. For North American customers, it'll be available on March 22, while those in Europe will be able to get their hands on the New York City-based shooter on March 25. 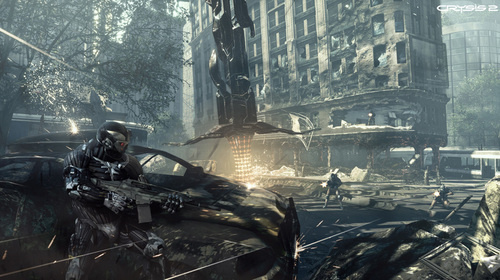 Like the first game, Crysis 2 will be available on PC, and for the first time in the series you'll also be able to buy it on PS3 and Xbox 360.